All of our archival media are rated at over 75 years longevity. All pricing is calculated by the square foot, so you will find that the pricing favours larger prints and volume orders. Pricing is based on the total number of square feet for each print. Special quotes and discounts are available for students and on larger volume or mixed size orders. 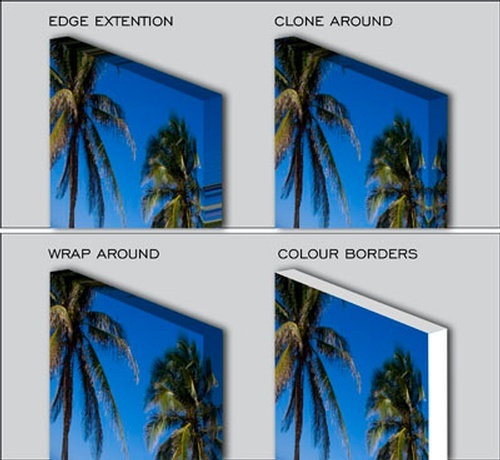 The prices include PRINT, Stretched onto a wooden frame and UV protective coat. - For prints stretch onto a 0.75" stretching bar our turn around time is 24 to 48hrs. - For prints stretch onto a 1.50" stretching bar (custom made) our turn around time is betwen 5 to 7 business days. Customs sizes are available. Clear coating, mounting, and laminating are NOT included in the cost of printing. Foam core mounting is available by quotation. All scan pricing is based on the same cost per Mega Byte (MB), so it doesn't matter what type of original you have. The total file size of your scan is used to determine the appropriate price break. We can scan from transparencies, negatives, photographic prints or original artworks; however, if you are supplying negatives, it will be helpfull if you can provide a photographic print for colour reference. Scan prices DO NOT include any set-up charges or applicable taxes. This calculator is for estimating purposes only and all prices are rounded up to the nearest dollar.